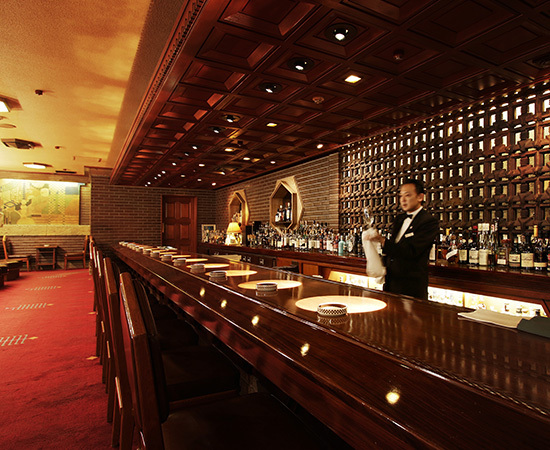 The glamorous Old Imperial Bar embodies the tradition and spirit of the grand Imperial Hotel. The counter is made of high grade rosewood. Each individual seat is illuminated by a spotlight, making the cocktails look even more beautiful. 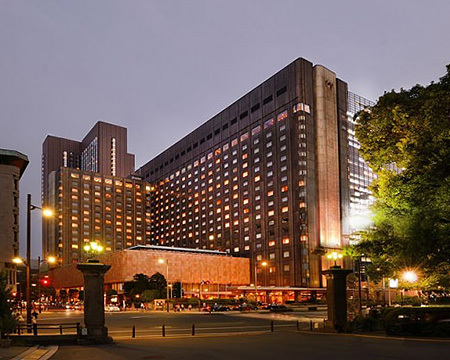 Reflecting the Imperial Hotel's history, the artistic terracotta walls and geometric patterns of Oya stone* at the left rear of the interior are particularly eye-catching. 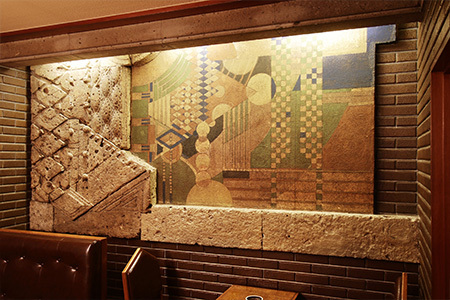 The bar preserves the classic motifs from the original Imperial Hotel building as designed by Frank Lloyd Wright in 1923. 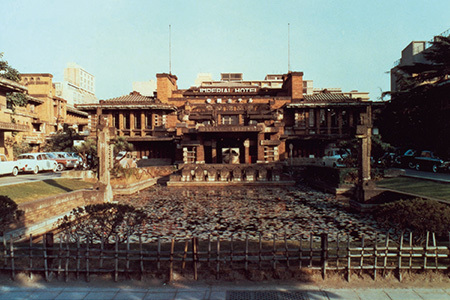 The original hotel, renowned as the "Jewel of the Orient," was the only hotel in Japan designed by the master architect and for many years was simply called the Wright Building. 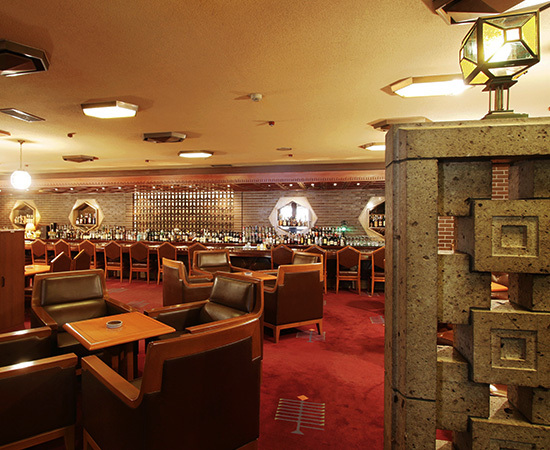 Although the original building was demolished in 1968, the artichitectural heritage and fine craftsmanship are preserved in the Old Imperial Bar. The Imperial Hotel inherits more than just its facade from the Wright Building. We honor the dignity of our heritage with an elite standard of service. Our spirit of classic hospitality cultivated over the years provides guests with an unrivaled experience. The “Mount Fuji,” invented the year after the opening of the Wright Building. A beautiful gin cocktail, with an egg white imitating light snowfall. Our staff are deeply dedicated to providing the highest quality in personalized service. 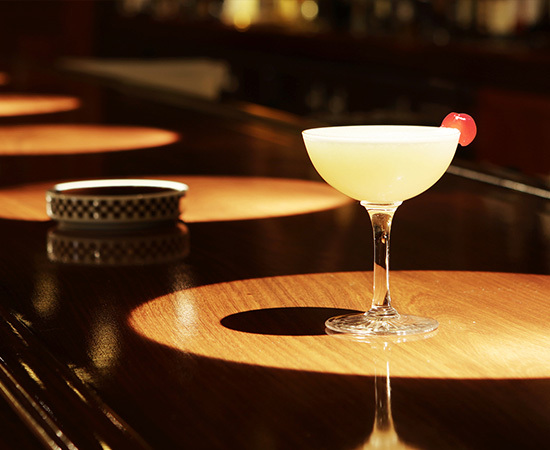 The bartender notes the position and angle at which the guest places the glass and will serve every following drink in the precise spot they prefer. Although such minute, subtle details often go unnoticed, staff members are dedicated to providing this type of humble, unobtrusive service which makes a stay at the Imperial Hotel such a pleasure. This is of course only one example of the exceptional level of service the Imperial Hotel has cultivated over the course of a century. The atmosphere of the original building is faithfully reproduced. Evey detail honors Wright’s original design, from the lighting and interior to the tableware. (*) This stone is mined in the region around Oya-machi in Utsunomiya, Tochigi Prefecture. It is relatively easy to manufacture and is often appointed for designer walls and similar purposes. 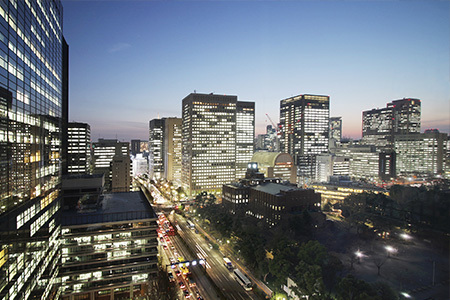 Top photo: The “Mount Fuji,” invented the year after the opening of the Wright Building. A beautiful gin cocktail, with an egg white imitating light snowfall. Center photo: The counter is made of high grade rosewood. Each individual seat is illuminated by a spotlight, making the cocktails look even more beautiful. Bottom photo: The atmosphere of the original building is faithfully reproduced. Evey detail honors Wright’s original design, from the lighting and interior to the tableware. The Wright Building is said to have been inspired by the famed Phoenix Hall at Byodo-in Temple in Uji, Kyoto. Constructed using a skillful combination of Oya stone and brick, the illustrious building was for many years “The Reception Hall of Japan” for visiting dignitaries. Oya stone facade repurposed from the original Frank Lloyd Wright-designed building. This is the place most evocative of the original world-renowned architectural masterpiece. The table setting is even the same as it was when Marilyn Monroe stayed here. 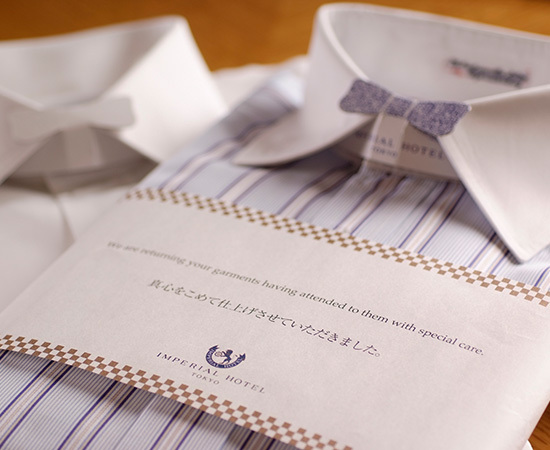 The Imperial was the first hotel in Japan to offer laundry services. People all over the world place great confidence in our warmhearted service. Keanu Reeves' famous line in the final scene of the film Johnny Mnemonic was actually an ad-lib by the actor. Reeves was so impressed by the laundry service at the Imperial that he remembered it on the highly tense movie set. 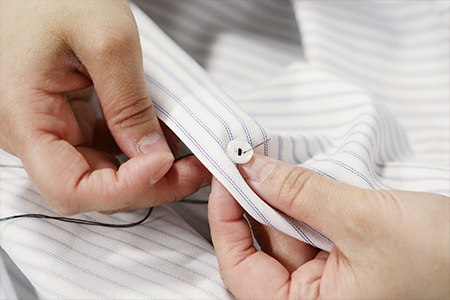 Our professional laundry, dry cleaning, and clothes-pressing services, are tailored to suit our guests' every need—from stain removal to button-sewing. All laundry staff have undergone at least four years of training and handle all services with the utmost care and attention. This standard of service impresses even VIP guests familiar with luxury hotels. Doorman Mr. Hasegawa welcomes guests. A hotel staff with a deep awareness that the customer comes first fosters superior hospitality. This impeccable level of service is ubiquitous throughout the hotel. 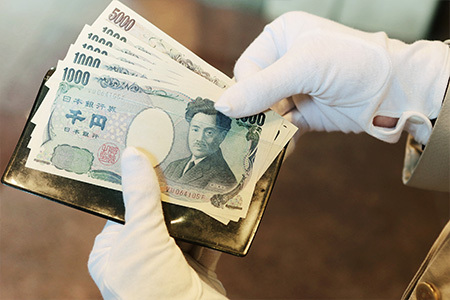 Doormen change their gloves every 30 minutes so that they are always immaculately clean when handling guests' luggage and keep 1,000 and 5,000 yen bills on hand in case guests need to make change for a taxi driver. Such humble, subtle gestures lie at the core of Japanese hospitality and demonstrate how seriously the Imperial Hotel values service. This dedication to guest satisfaction is rooted in a spirit of hospitality that has been passed down since the hotel’s founding. All of our employees endeavor to constantly anticipate a guests' every desire. 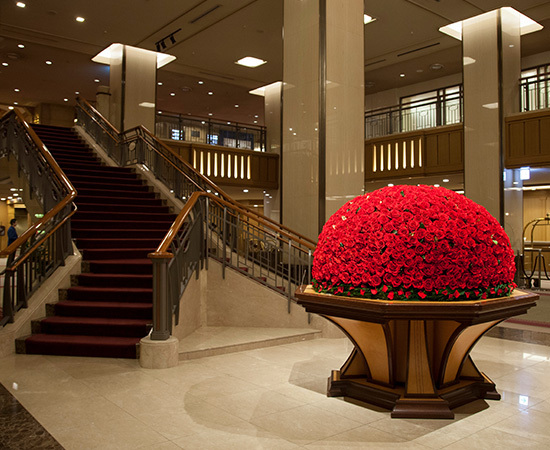 Top photo: Beautiful seasonal floral arrangements greet guests at the lobby entrance. 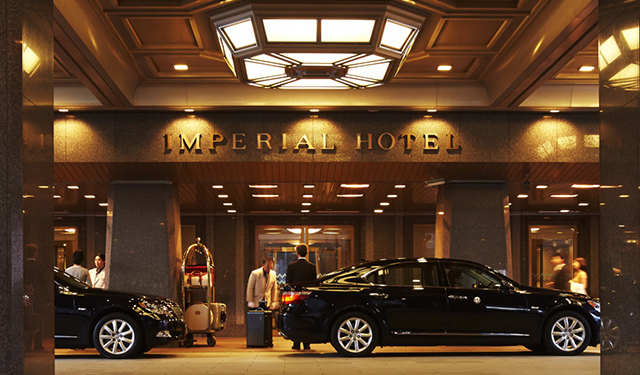 Center photo: The Imperial was first hotel in Japan to offer laundry services. People all over the world place great confidence in our warmhearted service. Bottom photo: Doorman Mr. Hasegawa welcomes guests. A hotel staff with a deep awareness that the customer comes first fosters superior hospitality. Fragile buttons are removed before laundering. This careful practice exemplifies our spirit of service which spares no effort in satisfying guests. The doorman keeps 5,000 and 1,000 yen bills on hand so guests arriving by taxi need not trouble themselves making exact change for the driver. 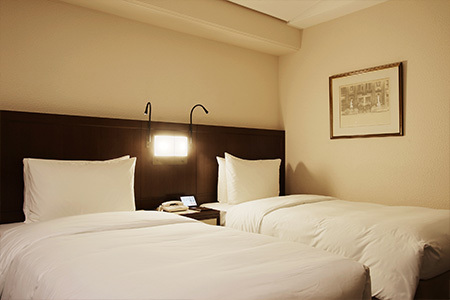 The Imperial Hotel’s spirit of hospitality is reflected in every single guest room. The stewards and guest attendants stationed on our exclusive Imperial Floors on the 14th to 16th floors are living symbols of this dedication to service. A guest attendant greets guests as the elevator opens. Staff members remember your face and your room number when you check in and dedicate themselves to providing perfect, personalized service. Kimono-clad attendants warmly welcome guests and help carry luggage upon arrival and departure. They are available throughout your stay to make absolutely sure every guest gets the service they deserve. Attendants do more than offer standard hotel services—they endeavor to provide the service best suited for each individual guest. The exquisite elevator landing, exclusive to the Imperial Floors. This humble service charms first-time guests into loyal clients. 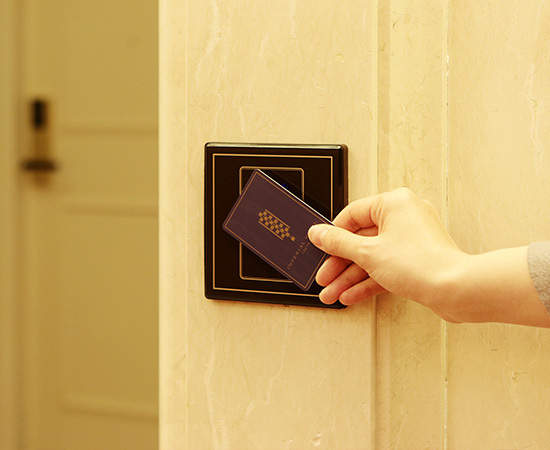 Elevator landings and guest rooms are separated by keycard entrances for optimal security. Top photo: A guest attendant greets guests as the elevator opens. Staff members remember your face and your room number when you check in and dedicate themselves to providing perfect, personalized service. 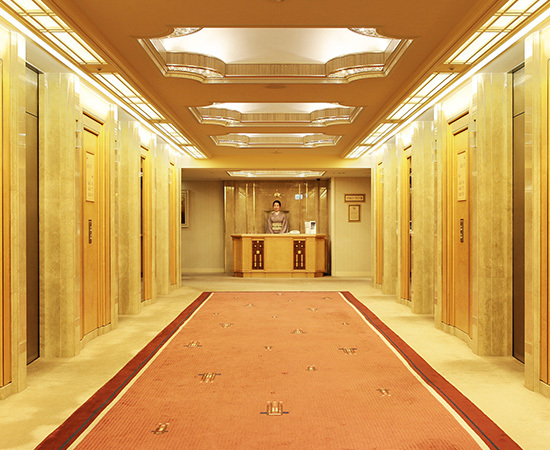 Center photo: The exquisite elevator landing, exclusive to the Imperial Floors. Bottom photo: Elevator landings and guest rooms are separated by keycard entrances for optimal security. Our Imperial Floors were newly renovated in 2005. These open spaces with high ceilings offer a formal, yet relaxed atmosphere. With tea-colored tones, the design emphasis is on balancing elegance and functionality. Coved ceilings make the rooms feel even more open and spacious. All rooms on the Imperial Floors are designed by U.K. interior designer Julian Reed. The concept behind the design is a fusion of tradition and modernity. Our design pays tribute to the storied history of the Imperial Hotel while employing cutting edge technology to provide optimum comfort. SleepWorks mattresses are cushioned on both the top and bottom and woven with special fabric that emits negative ions. 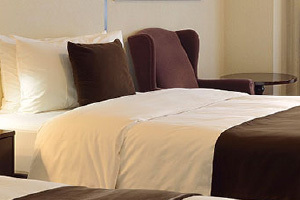 They are topped with fine duvets stuffed with top-grade goose down for a rejuvenating sleep. 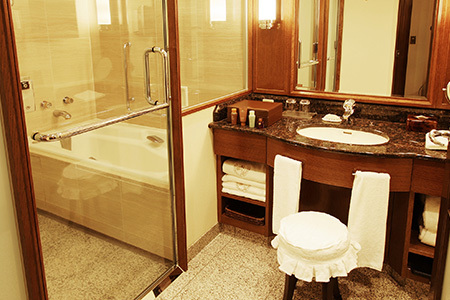 Bathrooms are functionally designed with the shower room and bathtub as a combined unit. Night view from Imperial Lounge Aqua. 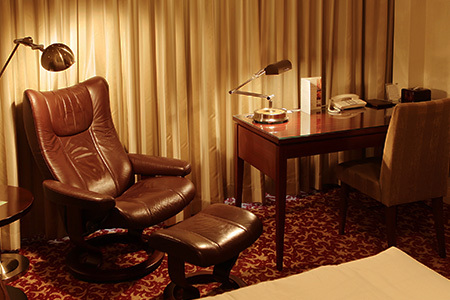 All furniture including the reclining chair and table were produced exclusively for the Imperial Hotel. These highly functional pieces are collaboratively developed by designers in Japan and abroad. The top floors of the tower (30th and 31st) were renovated in 2016 into our Premium Tower Floors. Rooms on these floors are especially bright, with openness as the key design principle. 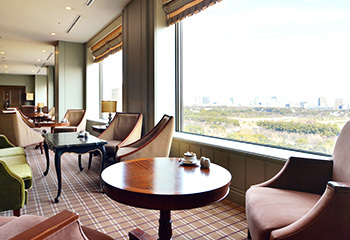 The expansive view from the windows includes the outer garden of the Imperial Palace, Hibiya Park, and the Ginza cityscape. In contrast to the Imperial Floors which honor tradition and formality, these floors have bright, modern interiors with white overtones. They are especially popular with younger guests and visitors from abroad. The room interiors have bay windows which bring in plenty of light. Like the Imperial Floors, the Premium Tower Floors are served by full-time guest attendants to assist you during your stay. Additionally, guests on the Premium Tower Floors are served continental breakfast with freshly-baked bread is their room each morning, and free soft drinks are available in the minibar. The reading lamp by the bedside was developed by a member of our engineering staff nicknamed “Master Inventor.” It bends freely and can be adjusted it to any angle. A fitness center, pool, saunas, and massage room are available exclusively to our guests for rejuvenation and relaxation. Gym clothes and bathing suits are available for rent (charges may apply), and paid lessons are offered exclusively to hotel guests. Pass the time in supreme bliss in any of our elegant salons and clinics dedicated to rejuvenating mind and body and relieving everyday fatigue. 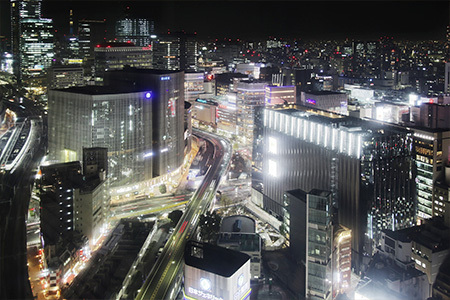 On-site salons include the Tamaki Esthetic Salon, the first in the world to incorporate dietary supplements, the Esthetic Salon Guerlain Paris, a nail salon, and a dental clinic. Please contact the number below for details about facility hours, pricing, and to make an appointment. Restaurants Four culinary adventures to satisfy your taste buds and your spirit. 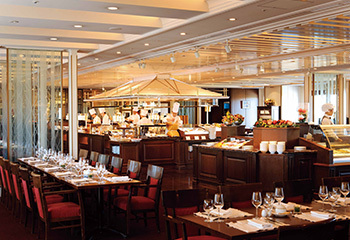 The Imperial Hotel was the first in Japan to offer buffet-style dining. The Imperial Viking Sal is the latest incarnation of this buffet restaurant tradition. Our restaurants have hosted many important dignitaries and witnessed significant historical events, including when Queen Elizabeth enjoyed an Imperial Hotel luncheon at La Brasserie. 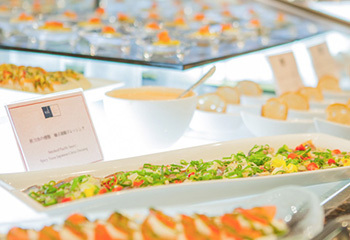 The hotel has a wide range of restaurants to please all palates, from traditional French cuisine praised as “Paris in Tokyo,” to teppanyaki, traditional Japanese cuisine, and modern Chinese. The restaurant staff uphold the same Imperial Hotel hospitality standards as the hotel staff. For example, hosts at Les Saisons are conscious to move carefully around guests so that they may devote all of their attention to their dining experience. 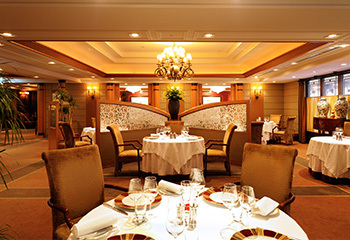 Indulge in French cuisine created with specially selected ingredients in our main dining room. Chef Thierry Voisin, a veteran of the famed Les Crayères in the Champagne region, brings an original sensibility to classic French cuisine. 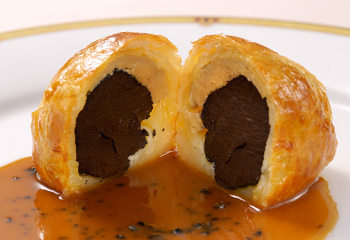 Round puff pastry stuffed with truffle and smeared with foie gras. The exquisitely balanced sauce enhances the fragrance that wafts up the instant your knife cuts the crust. ※Not available for children 10 and under. 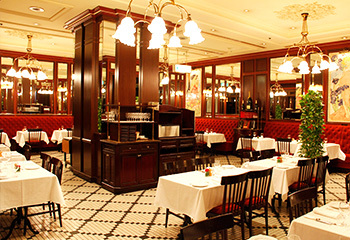 This classic French restaurant has been in the Imperial Hotel since its opening. Successive generations of head chefs have inherited a great tradition of dishes including Chaliapin steak, an Imperial Hotel original. This steak was invented to honor the Russian opera singer Fyodor Ivanovich Chaliapin, who stayed at the Imperial Hotel in 1934. The Imperial Hotel original all-you-can-eat buffet. The open kitchen offers some 40 dishes, from potato salad to a filet mignon puff pastry lunch special. *1 Weekday rates. Prices may differ on weekends and holidays. *2 On weekends and holidays. 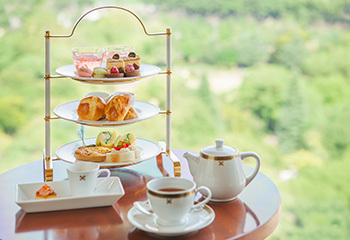 Gaze upon the greenery in Hibiya Park as you enjoy an authentic British afternoon tea. In the evening, unwind with a cocktail to live piano music. *After 18:00, children 13 years and under may only dine in private rooms. Lunch and tea time menus are current as of March 11th, 2016.